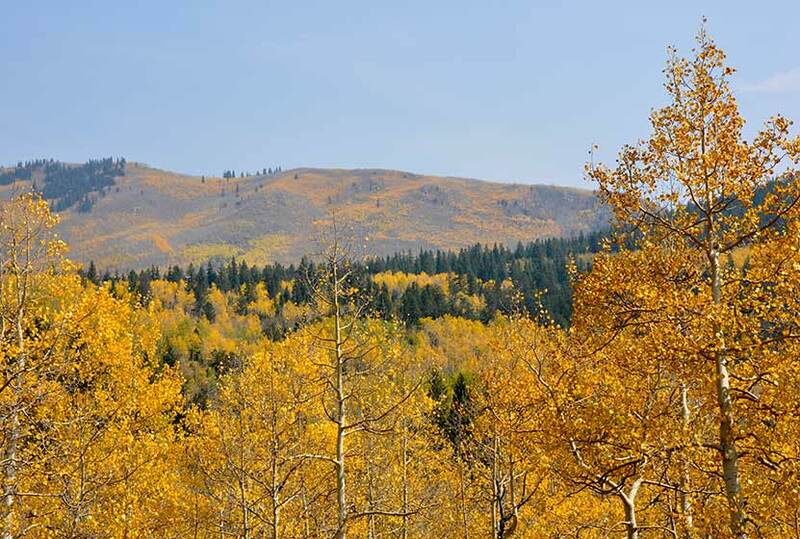 Kenosha Pass is probably the best place to view the changing aspens near Denver. It offers both an East and West trail option with gradual ascents to stunning views. 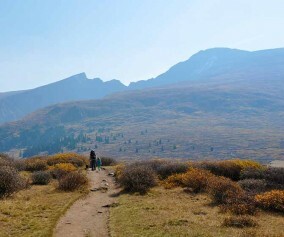 Starting at 10,000′ the initial elevation gain on the trails make for easy to moderately strenuous hikes, all depending on how far one decides to travel on these beautiful segments of the Colorado Trail. Vantage points can be accessed about 1/2 mile up both trails offering views down into the high country plains of South Park and out to the Rocky Mountains. 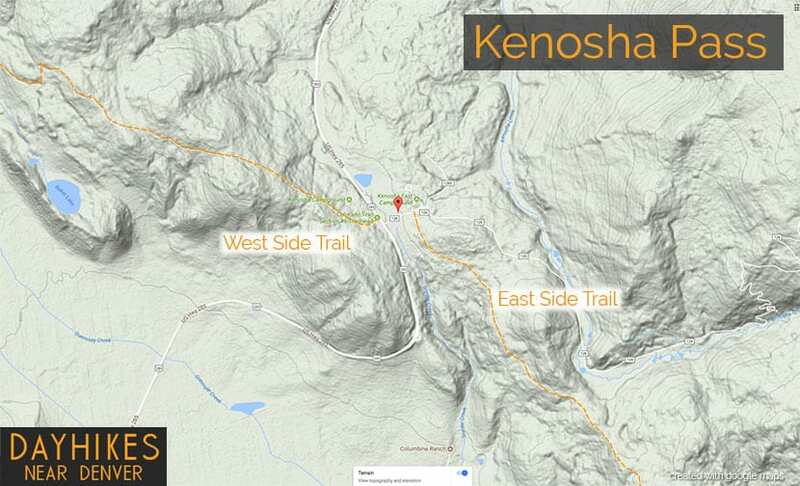 Explore the full Kenosha Pass hike profile below for trail map, driving directions, and more tips and details to help you enjoy this Colorado hike. Kenosha Pass is located about 65 miles southwest of Denver along US 285. From Denver, take US 285 towards Bailey, Colorado. 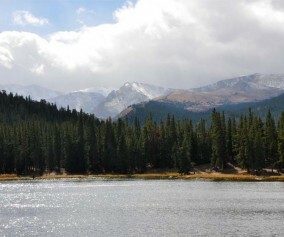 From Bailey, continue driving approximately 19 miles on 285 to the Kenosha Pass Trailhead. The trailhead parking area is located on both East (left when coming from Denver) and West (right side when coming from Denver) of 285. There is additional parking on the East side after crossing a cattle gate. Parking can get tight in the Autumn when the aspens are at their peak, so be considerate of others and the land as you park your vehicle. It’s about a 90 minute drive from Denver. Restrooms can be found on both trailheads. 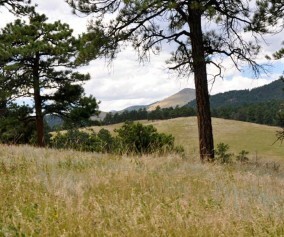 The hiking trails at Kenosha Pass easy to moderate in difficulty and can be done by hikers of all experience levels. At Kenosha Pass, the Colorado Trail, which goes from Denver to Durango, intersects with US Highway 285. This creates an East side trail option and an West side trail option. Both offer incredible views down into the South Park plains of Colorado and out to the often snow-capped peaks of the Mosquito Range. 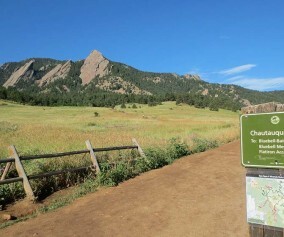 Hikers can pick up the Colorado Trail after crossing the cattle gate (if parked along 285) and hiking along the dirt road that leads to the restrooms that are near the 2nd parking area (after the cattle gate). The Trailhead is located just before the 2nd parking area, and will be located on the right (south). 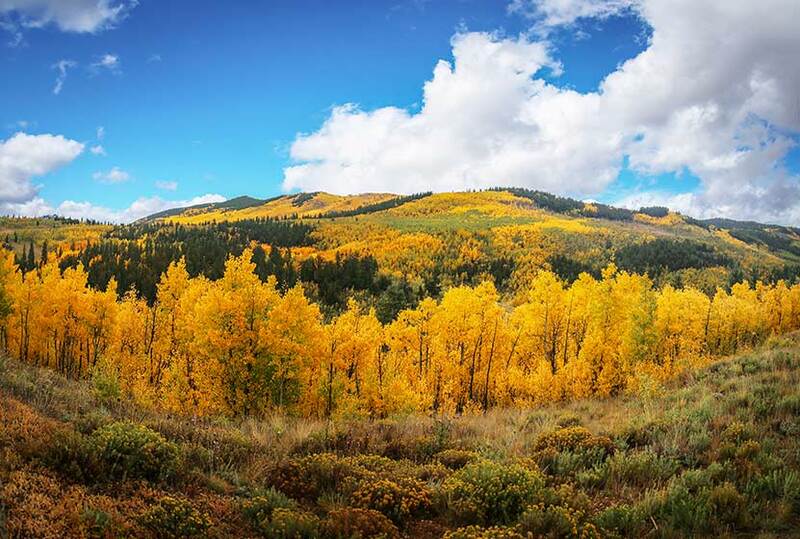 While most visitors park, take a jaunt into the aspens, snap a few photos and leave, the more stunning views await those who venture further south along the trail. The initial trail segment enters with a gradual ascent into the aspens, then at 1/2 a mile into the hike the woods opens up to incredible views into South Park. South Park is a high mountains plains area that stretches out mile-upon-mile to its western and norther mountain borders, the Collegiate Peaks and the Mosquito Range of the Rocky Mountains. The climb continues at a gradual pace and hikers will emerge to a second panorama at 1.5 miles. This is a great place to turn-around, making it into a 3 mile out-ant-back hike. Of course, hikers can continue on the trail all the way back into Denver, but that requires a multi-day backpacking trip. As always, keep eyes peeled for changing weather, and pack the 10 Essentials. If you are wondering what should be in your daypack, be sure to download our free Dayhike Hiking and Packing Guide. 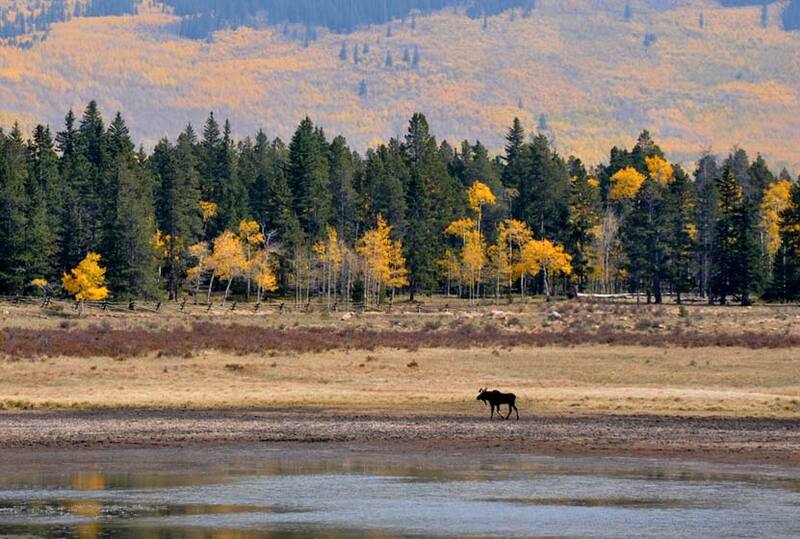 As for wildlife, moose are often spotted on this side along the lake near the trailhead. The West Side Trail at Kenosha Pass can be picked up immediately on the West side of 285. The trail enters conifer and aspen forest, making a gentle climb toward the northwest until popping out of the trees to breathtaking views down into South Park and the Mosquito Range. After this viewpoint, the trail travels a short distance uphill, then makes its way down toward Guernsey Creek. The distance from the trailhead to Guernsey Creek is approximately 3 miles, making this a 6 mile out-and-back adventure. Because this is the Colorado Trail, it does continue west, offering multi-day backpacking options that lead all the way to Durango, Colorado. TIP: Bring sunscreen for protection against the sun. TIP: One the east side of the highway, there is another parking lot with a lot of bathrooms. Photo: We would like to express our gratitude to Ed Ogle for sharing such an amazing photograph of this hike on Kenosha Pass.